Europe and North Americans were regular users of cutlery until the late 1600s. They either used fingers or knives (that were weapons not tools). They were long handled kitchen spoons to stir the pot and “table” spoons that were more like mini-bowls on a stick for eating soup. A rudimentary two pronged fork was also used in the kitchen to stay meat while carving, this too eventually made it to the table. Knives have been around since the dawn of man in some form or another, whether bone or stone. Spoons were next being made of shells, wood or carved ivory. Once in the Iron Age we started using metals like iron and the Greeks used bronze and pewter (which lead content had some nasty side affects). The Europeans in the Middle Ages around the 16th century stated to use tin or silver with decorative handles. In the last half of the 1500s Queen Elizabeth the First started carrying a case with a knife, spoon and two pronged fork was cutlery officially part of upper culture. It wasn’t until around 1750 that the average European and American started this custom. In the U.S., the first cutlery factory for the manufacture of pocketknives was established at Worchester, Massachusetts, in 1829. As United States steel improved in quality and decreased in price, the industry developed steadily, particularly in New England. Early cutlery was hand forged, a method still used in the manufacture of certain high-quality products. In modern times, all types of cutlery, including forks, table knives, scissors, carving knives, and razors, are produced by machines. Such machinery was first developed in the U.S. and is now extensively employed in Britain and other industrial countries. – from the Microsoft® Encarta® Encyclopedia Deluxe 2000. Copyright © 1993-1999, Microsoft Corporation. Cutlery – in general usage, term applied collectively to all types of cutting instruments. Cutlery – various types of implements for cutting, preparing, and eating food. In addition to different kinds of knives and the steels to sharpen them, the term usually encompasses forks and spoons. Flatware – utensils, including knives, spoons, forks, and other specialized implements, for eating and serving food. 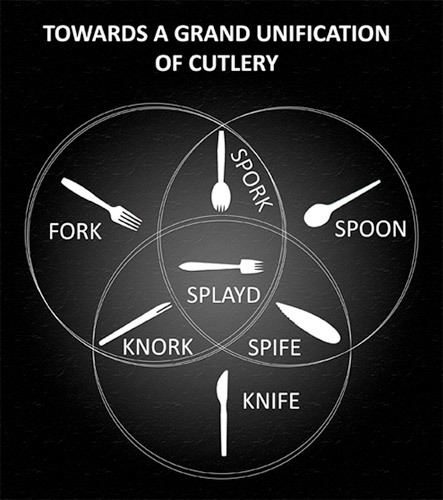 Flatware is also known as cutlery. Tableware – dishes, plates, glasses, flatware, and other articles used at meals.